I’m always looking for ways to get my greens in, especially kale. Kale is an amazing, nutrient rich food. On Dr. Furhman’s Nutrient Density Score, Kale gets a whopping 100%. This means Kale is an incredible “nutrients per calorie” food. This Kale Slaw with Curried Almond Dressing was such a refreshing way to eat kale. I usually put kale in my green smoothies or make kale chips, but I wanted delicious way to eat it raw. I certainly found it! What makes this slaw so special is the dressing. It really brings this slaw to life–DON’T SKIP IT! The dressing recipe caught my eye because it does not use oil. Love that! It uses the natural oils in the nuts as an emulsifier. I’m getting more and more into homemade salad dressings that use nuts in place of oil, especially now that I have a Vitamix blender that can pulverize those nuts into the smoothest of dressings. The dressing is a snap to whip up. It takes just minutes. So creamy! I had quite a bit of dressing left over, and used it as an awesome vegetable dip. Isn’t that that salad so pretty? I used my favorite mandolin slicer for the apples and carrots. It is one of my most used kitchen utensils because it is so fast! I changed the original recipe up a bit, using the fruits I had on hand. 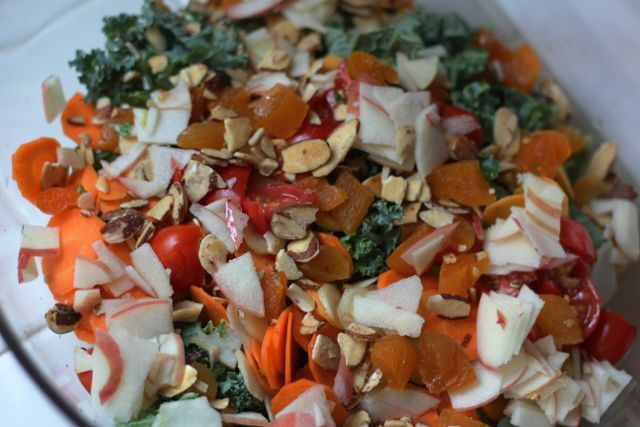 The apples & dried apricots make this a nice, hearty fall salad. It would be a beautiful addition to your Thanksgiving menu. The dressing is luxurious. No one would ever know that the only fats are healthy ones from the nuts. It does not a strong curry taste, so even those who are not big curry fans just might like this dressing. Something I love so much about kale is how it holds up to dressing. You can store this for days and the leaves will not get soggy. It makes a big batch, and after we had it with a pasta dinner, I ate the leftovers for lunch for several days. Place all ingredients into a large bowl. Toss to combine. Add Curried Almond Dressing. Toss to coat well, then let sit for 5 minutes or more to allow the kale leaves to soften slightly in the dressing. Serve, garnishing with a light sprinkling of almonds and extra salt and pepper, if desired. Using a standing blender or an immersion blender and deep cup or jar, puree all the ingredients (starting with 1/2 cup of the water) until very smooth. (A high-powered blender such as a Vitamix works best to smooth out the dressing; using an immersion blender or regular blender will leave a little more texture and take a little longer. ) Add additional curry to taste, and additional water to thin as desired. Note: 1/8 rounded teaspoon of curry powder in this dressing makes for a very muted flavor, but if you love curry, use more. Note: Adjust water according to you tastes. If making this as a vegetable dip, use less water. How fun to have you comment on the site. I adore your cookbook and use it often! Made this last night. So GOOD! Daughter had two helpings and wanted a third. Didn’t have cranberries or apricots. So, just used an apple and pear. Upped the curry. Can’t wait to try it with clementines. I think that would be outstanding. Thank you for such a healthy and delicious recipe! One apple sliced is listed twice in the ingredients. Is it really two apples or is this a typo? Thanks looks yummy!